1975: What happened when doctors last went on strike? The last time doctors took industrial action was in the mid 1970s when consultants and junior doctors decided to withdraw non-emergency services. The consultants worked to rule and suspended all "goodwill activities" between January and April of 1975 in protest against proposed new contracts which they said would force them to abandon private practice. The action was called off when the then social services minister, Barbara Castle, said consultants opting for part-time NHS contracts could continue private practice. Later that year, doctors again took on Ms Castle over plans to phase out private work from NHS hospitals. The doctors union, the British Medical Association, urged consultants to limit their work to emergencies only (but to care for those already in their wards), but the action was suspended after the government's legal expert, Lord Goodman, produced proposals which would hand the issue over to an independent board. In November 1975, it was the turn of junior doctors to take industrial action over pay and conditions set out in new junior staff contracts. The doctors were advised to keep to a 40-hour week and deal with emergencies only, but an agreement was reached with with government the following month. Dr Tom Frewin, now a GP in Bristol who voted in favour of industrial action this time, was a junior doctor working in a neurosurgery unit in London during the 1975 action. He was already working a "one in two", meaning most days and every other night, and with the unit dealing mostly with emergencies anyway, taking any kind of action would have left lives in danger. "We thought we would do something because we wanted to support the rest of the profession, but it was hopeless," he told BBC News. "To walk out and let people die was not on the cards. You just don't do that." Another doctor, a retired consultant psychiatrist who prefered to remain anonymous, told the BBC of her mixed feelings back in 1975 when she was working as a junior doctor in Tooting, south London. "I remember quite a personal conflict," she says. "It had been made very clear during our training that the country was providing an enormous amount of money for our training. "But you also have a loyalty to yourself and to your pay and conditions." There was was also a loyalty to the patients, she says, particularly the psychiatric patients who had nowhere to go. When the industrial action began, instead of visiting these wards, she would call though to the nurses to ensure all was in order. "What I remember in particular was how nice the nurses and the other people were - they didn't make it difficult for us in any sense." 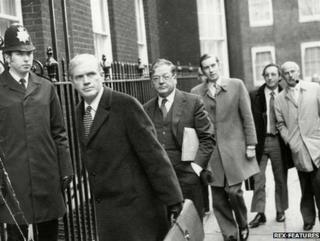 The strike by doctors in 1975 was not the last time the NHS was affected by industrial action. In the late 1980s ambulance staff and nurses walked out in a dispute over pay. And as recently as last autumn, nurses, paramedics, administrative staff and hospital porters were involved in a day of strikes across the public sector over the pension changes. During the action, thousands of elective operations had to be cancelled and in London the ambulance service declared an emergency and was only able to attend to the most serious call-outs.